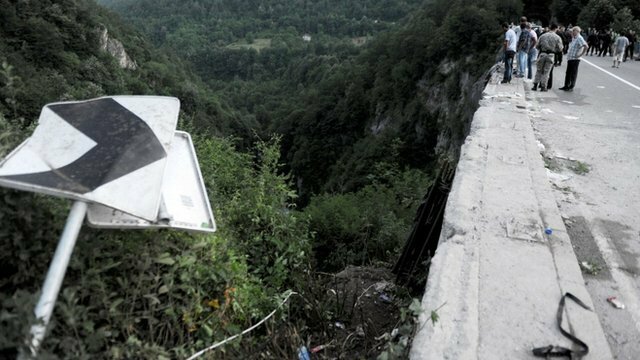 A bus with Romanian nationals has plunged off a bridge over the Moraca river in central Montenegro, killing 18 people and injuring at least 30 others, local officials say. The bus toppled 40 m into a ravine 30 km (18 miles) north of the capital Podgorica, reports said. Officials said there were almost 50 people on board, and all the victims were Romanian nationals. The cause of the accident – which happened during a rain storm – is now being investigated. Montenegro’s Interior Minister Rasko Konjevic described the crash as “an extremely serious accident”, saying a number of people were “in a life-threatening condition”. The officials say the injured are being treated in hospital in Podgorica. Most of those on the bus were pensioners who had left Romania on Saturday for a holiday, Romanian media reported. A child was said to be among those hurt, believed to have been standing on the bridge at the time of the crash. Because of the difficult terrain, it took rescuers some time to move all the victims from the ravine. Romanian ambassador to Montenegro, Mihail Florovici, visited the injured in hospital, describing the incident as a “huge tragedy”, the AFP news agency reports. The narrow winding roads in the mountainous region are notorious for traffic accidents.